Pasta sauce can be made from scratch or purchased in a can or jar. 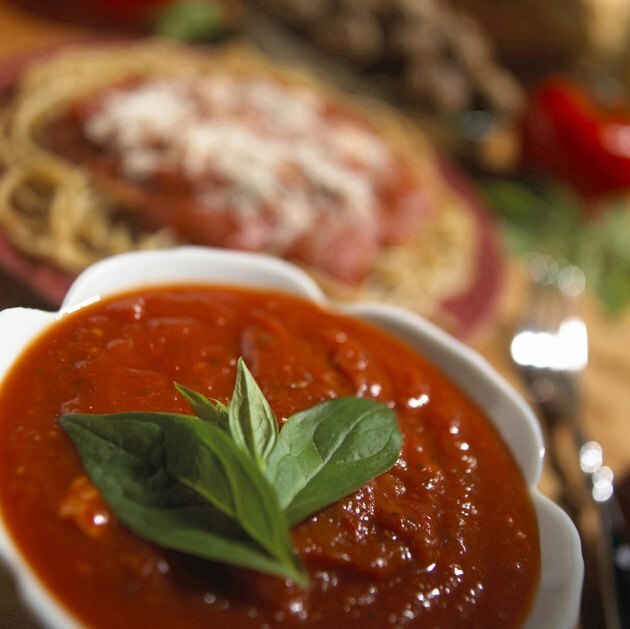 Regardless of how you obtain your pasta sauce, it is a key ingredient in a variety of dishes. However, the acidity from the tomatoes can upset some people's stomachs and have an unpleasant taste, according to "Contemporary Nutrition." If you find that your pasta sauce is more acidic than you're happy with, you can quickly and easily reduce its acidity. Remove seeds from the tomatoes if you are making homemade pasta sauce. According to "Techniques of Healthy Cooking," the seeds are the most acidic parts of tomatoes. Heat the pasta sauce in a pot over the stove. Add 1/4 tsp. baking soda for every 12 oz. pasta sauce to the pot. Stir the sauce with the ladle. The baking soda will neutralize the acidity in the sauce without compromising its flavor. Stir 1/8 cup Parmesan or Romano cheese for every 12 oz. pasta sauce into the pot. The calcium in the cheese will further neutralize the acidity of the sauce and add a cheesy flavor and texture to the sauce.